NHL Relocation: Which Teams Could Be Moved Next? And Where To? Barring something unexpected, the Atlanta Thrashers will be relocated to Winnipeg, Manitoba in the offseason. So which struggling clubs could be moved next? And to where would they move to? 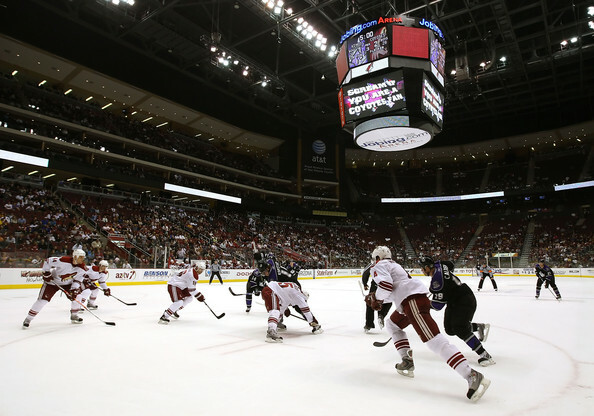 There is a very slim chance that the Coyotes will stay out in Glendale past next season. The team has struggled to find a new owner, attendance has been putrid despite a very good team, and a very tough lease at Jobing.com Arena. The NHL has been trying to succeed in the large Phoenix market really hard but it just does not seem to be working. The Islanders have been losing a lot of money for years and have been consistently towards the bottom of the league attendance of late. The Islanders desperately need to move out of the decrepit Nassau Coliseum and into something modern but they have been unable to get a plan to work. They have finally put together a plan for a new arena but if the citizens of Nassau County choose to not pass it, the Islanders will most likely move. The Panthers had their fair share of success in their early days but of late they have been a middling NHL club at best and they have never drawn very well. They do play in the beautiful BankAtlantic Center but we all know what Miami area sports fans are like, they struggle to go to Heat games on time. The South Florida market is another one that Gary Bettman would love to see succeed like San Jose or Anaheim but I just do not see it happening. The capital of Quebec lost the Nordiques at a time when the Canadian dollar was struggling mightily and Le Colisee began to become a second-level facility. Now the Canadian eceonomy is going strong and the city is looking to bring back a team. Now Quebec does not have an arena suitable for a NHL club but the city has announced that they are building a new state-of-the-art facility and while the market is pretty small, the city of Quebec looks to be receiving a hockey club sooner rather than later. The city of Hamilton has been linked as a potential host of a new NHL club but the sketchiness of prospective owner Jim Balsille has many in the league offices worried. However Hamilton is in a hotbed region for hockey and has a standing facility that has been planned to be renovated if a club moves to the city. One of major standstills to a club moving to Hamilton could be the protests of the Buffalo Sabres, as the team would be playing within a 50 mile radius of their own home arena. One of the biggest draws of KC is the presence of the sparkling new Sprint Center, which has been relatively vacant and is craving an NHL club. The problem is whether the region could really support an NHL team as the NHL has tried to make it in Kansas City and failed. Whether the NHL would want to return to a region that does not have past success is open for debate. Seattle has desired to bring a sports team ever since the Supersonics relocated to Oklahoma City and an NHL team in Seattle would have a natural rival with the Vancouver Canucks. But there is no arena ready for an NHL team but if the city does build one for a new NBA team, maybe the NHL could look to expand to the city as well.